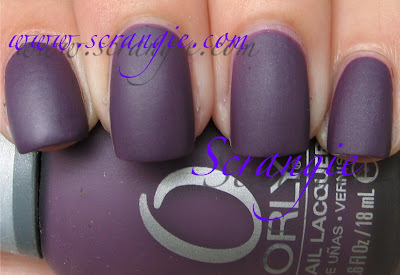 This is Orly's second matte release but I'm not really feeling it... I'm getting matte overload! Blue Suede. A soft medium blue creme with a satin matte finish. This one was my least favorite of the collection. I like the color but the finish is too... rubbery? I want my mattes to be REALLY matte, not this in-between look like you've been wearing it for a day already. Purple Velvet. A purple-toned dusty dark mauve with subtle shimmer. This one is slightly more matte than Blue Suede but not completely shine-free. I like this one a lot better. This is the only one with a hint of shimmer- barely visible but it's there. Matte Vinyl. Matte black creme. This is a pretty good matte black. It's not as deep and dark as the KO black, it's more of a soft black. I used this for the base of a really cool chrome Konad design that I'll post soon. The formula on these was... so-so. They are a lot thicker than the other mattes that have been released this year and they take longer to dry. I did have a little trouble applying them smoothly, even with my matte application technique that works for all the other ones. Wear time is average for mattes- I wore Matte Vinyl for two days- it was shinier by the end of the first day and chipped on the second day. No better or worse than any other matte. I think I might be all matted-out for the year. I'm feeling pretty ambivalent about these mattes. I probably would have liked them more if I had them a month or two ago when I was still craving mattes. I love that Matte has finally come back and that everyone seems to be jumping on the matte look bandwagon, but a lot of these matte colors are kind of... what's the word? Mundane perhaps. I'm leaning toward favoring a matte topcoat over matte-finish polishes, it's more versatile. Although, some of the matte-finish polishes have been totally awesome, like the Zoyas (Savita OMG). Am I being too harsh? It just feels like too little too late to me, you know? I mean... they're not bad, they're just not interesting. I would have liked to see more unique colors and a stronger matte finish instead of an almost-matte. Oh gosh those are lovely. I have been a bad girl, I just had to have some of those lovely Nubars you posted, the OPI Suedes and Mattes, and I have most of the OPI Holiday Collection as well as the Halloween OPI and China Glaze sets. They are in my Jeep. I couldn't sneak them in without Mr. Lesa seeing them. I can't wait to get my hands on the Orly Mattes. Mr. Lesa is going hunting tomorrow, so I can put all my pretties away then. I even organized my Urban Decay Makeup drawers down to one drawer so I would have more room for new polish. OCD about beauty stuff? You betcha! Well,first of all thanks for the swatches. These were the only mattes I bought, together with a few OPI suedes. I'm not liking the matte trend at all, but I liked the black for funky frenchs and the other two I'm gonna wear with a top coat (might be holo top coat as well). I loved the colors glossy, but not matte (nor any matte actually). Blue Suede is very photogenic. It reminds me of a bird's egg. I tend to like matte polishes with a shimmer formula better. I love the idea of using these as a base for Konad. I have to agree with you on every account here. I love my Essie MAY, but I won't go out and by spesific matte polishes (maybe except for the OPI Suedes). I picked up Blue Suede and I like it ok. I felt like it stayed around longer than my zoya mattes. I saw these sitting right next to the China Glaze Matte Magic and ended up getting that. I love the black, but prefer the option of matte-ing any of my already owned colors. OPI's Russian Navy Matte really tempted me but not enough to justify the expense for something that, at least for me, will be a fad. So far all I've coated is Orly's Enchanted Forrest, which I have on now. It's the second day and I'm satisfied with the matte that is left. Matte is something I'll play with while it's still new to me, but I still prefer a high gloss look. Thanks for posting these photos! I've seen some swatches elsewhere, but somehow yours help me see these in a 'now my lemming is dead' kind of way. That black does look neat, though. I think a lot of Orly's collections are too conservative. Following a trend, but nothing daring. Maybe that's their constituency, and maybe that's why I've never been thrilled with much they put out. Suited me fine in the Prepster Collection, love Cashmere Cardigan, but otherwise? Yawn. I do prefer using MAY as opposed to buying matte polishes; I get wear like a regular mani, and I can put it over glitters/shimmers w/ awesome results! I just can't get into the mattes. i think they look dull and boring. i prefer glossy nails! I've had Purple Velvet sitting on my tv stand for about a week or two now and haven't used it yet. I'm still not sure how I feel about the matte trend. I do love my CG Fortune Teller under CG Matte Topcoat, though. Adorei ! Cores fortes ! OMG! I love the blue & black one! where did you purchase these ? I was wondering about these, I saw them at Sally's and really wanted the purple one but now that I see your swatches I'm "meh" on it. I'm kind of over matte since I tried Essie's MAY... I tried it over so much stuff and in the end felt "meh" over 98% of it... matte just ruins the complexity of most shades. I LOVE how matte those are. That purple, the second one down, is really growing on me! ooh, i don't care for the matte look at all. it takes the glam out of nails! I agree, these new Orly mattes aren't that great. I mean, come on, three colors? They could have at least given us some cool colors, but all they gave were three that are kind of boring. I mean, kudos to people who like them, but I don't. They make me wanna snooze. Loving these and I never like Orly colors very much. Matte will never be a passing trend for me. I've never liked the look of a glossy nail. It looks plastic to me. Nothing is as elegant and sophisticated as a rich, matte nail polish. Matte makes electric teal look svelte and suave, and there is nothing like matte black!! More Nail Designs from Fing'rs EDGE!